A promising young black to continue our lines. 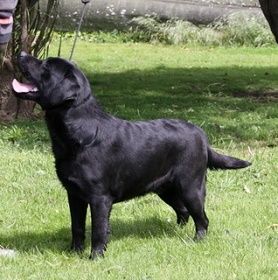 Critique from Wellington Lab Club Judge Mrs Jo Fleming of Blackwater Kennels. Smaller Dog, well balanced and short coupled with correct coat and tail, strong head with good reach of neck. Good spring of rib, well boned and in very good condition.